Premier League leaders Manchester City again left it late as they beat West Ham 2-1 to make it 13 straight league wins. Elsewhere, Manchester United goalkeeper David de Gea produced heroics as the second-placed team defeated Arsenal 3-1 and kept in touch with their city rivals. Chelsea overwhelmed Newcastle 3-1 to stay third and Liverpool thrashed Brighton 5-1 to move into that fourth Champions League spot. At the other end, Swansea sunk to the bottom of the table with a 2-1 loss to Stoke. If Manchester United win the title, it will be down to the brilliance of David de Gea. His performance against Arsenal was utterly breathtaking. The save after the ball inadvertently came off Romelu Lukaku's leg and flew in the direction of his own net was unbelievable. However, it was the double save from Alexandre Lacazette and Alexis Sanchez that turned the game for me. Had Arsenal equalised at that point, the outcome of this titanic tussle might have been very different. All credit to United. This is a player who was on the verge of signing for Real Madrid two years ago, and had it not been for a so-called 'clerical' error might have done. One manager later, and Champions League qualification, we have not heard a squeak from De Gea about wanting to return to Spain or Real Madrid for that matter. I wonder how much of that is down to the presence of a certain Jose Mourinho? Precisely why Arsenal defender Laurent Koscielny felt the need to play the ball to his left to a marooned Sead Kolasinac, which led to United's opener, I don't know. What I can tell you is that it set the tone for an extraordinary game of football littered with the most bizarre moments. From the moment Antonio Valencia cut out the ball, his sole intention was to make Arsenal, and in particular Koscielny, pay for his error. The fact midfielder Paul Pogba was involved in the move and rolled the most inviting ball for Valencia to control and smash through Petr Cech's legs wasn't wasted on me either. I refuse to allow the Frenchman's dreadful fluorescent-styled Mohican haircut to influence my regard for his talents. I have commended the performances of Valencia on a number of occasions already this season and continue to do so. The Manchester United captain continues to have an amazing influence on his team. This was one of the most professional performances I have seen from United away from home, and Valencia set the tone. The post denied him his first goal for the club against Newcastle, but I don't think this young star in the making will have to wait very long for it if he keeps playing like this. I was told to watch out for Andreas Christensen after his recent display against West Brom at The Hawthorns. I must say that particular performance passed me by, but since David Luiz fell out of favour at Chelsea, the young Denmark international has been making a bit of a name for himself and looks a real prospect. The run from deep inside his own half against Newcastle, prior to feeding Victor Moses a glorious pass inside the path of Matt Ritchie (who had a torrid afternoon), was a real indication of his growth in confidence. There is no doubt Christensen is not in Luiz's class yet, but if the Dane continues to progress at this rate manager Antonio Conte might consider releasing the high-maintenance Luiz at the end of the season as he has the far-less-combustible Christensen. What a difference a manager can make. The arrival of Sam Allardyce at Goodison Park seems to have made all the difference. Everton look unrecognisable from the side I saw get destroyed at Southampton. Against West Ham in midweek they looked lively, and during Saturday's game against Huddersfield their back four looked as solid as I have seen them for some time. At the heart of both performances was Ashley Williams. I have always liked Williams' approach to the game, and I was interested to hear him say in his post-match interview that the dressing room is now a much happier place. I should think it is: six points, two clean sheets and six goals in two games is title-winning football. But the question is, where do Everton go from here? They may have a new manager who will almost certainly keep them in the Premier League but what is the long-term future for the club? Are they intent of hovering in mid-table or do the owners have something special in mind? Whatever it is, the sooner they can share that with the new manager, the better for all concerned . Allardyce was prepared to come out of retirement for this. I hope it's worth it. I must say Chelsea look far more comfortable with Victor Moses back in the side. He not only provides them with far more options, but he can be quite lethal in the opposition's penalty area. Of course, it took an Italian coach to work out that Moses had the potential to be one of the most effective wing-backs in the Premier League, leaving all the other coaches Moses has ever worked with looking rather embarrassed. Two seasons ago, this player was being loaned out to club after club with no-one capable of unearthing his real potential. Moses has had remarkable success, having won the Premier League and Europa League at Stamford Bridge. Against Newcastle, it was patently obvious what Moses could do when he flashed a bullet-like cross towards Chancel Mbemba. The Newcastle defender appeared terrified by the quality of the cross, diving out of the way and allowing Alvaro Morata to score Chelsea's second in the 3-1 win. Similarly in the second half, it was Moses who forced Ritchie to give away the penalty which resulted in Eden Hazard converting from the spot. Moses has always been decent, but what Conte has done is convert an ordinary player into an outstanding one. What a pity more coaches can't do the same. David Silva has been directly involved in eight goals in his past 11 Premier League outings (two goals and six assists). I thought West Ham played really well and deserved to get something out of their match at Manchester City. Nevertheless, the very best teams seem to manage to get the points when they need them, and there is no doubt about it: Manchester City are on a roll. It wasn't one of City's greatest performances either, but they just did enough. 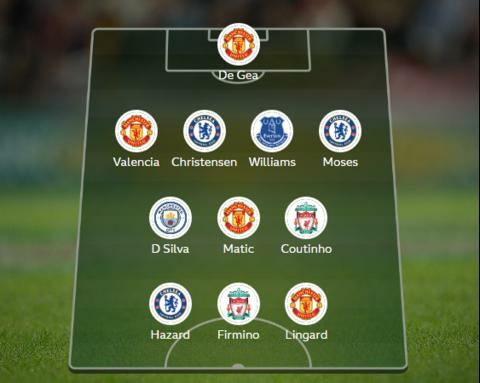 And in the absence of midfielder Kevin de Bruyne in my team of the week, I suppose it's fitting he is replaced with David Silva. I was so impressed with his performance against the Hammers because he appears to be another player who has had to adapt to the 'Pep Guardiola philosophy'. We all know Silva is an immensely gifted player, but this season I have seen him get into areas he wouldn't have dreamed of getting into under Roberto Mancini or Manuel Pellegrini. His winning goal was a perfect example of Silva getting in where it hurts. His display against the Hammers was a captain's performance if ever I saw one. Manchester United need to be concerned before next week's derby. City are picking up points, even when they are not playing well. Nemanja Matic limped off the pitch during Manchester United's impressive victory over Watford, but insisted he played in the following game at Arsenal. Big players demand to play in the big matches and Matic was determined to face the Gunners at Emirates Stadium on Saturday. It was just as well. The Serbia international was immense. He made countless interventions and blocked at least three shots destined for the back of United's net. Matic's performances may not be as pleasing on the eye as Pogba's, but he does relish the battle. If ever there was a game made for Matic, this was it. Arsenal took the game to United, but it was the 29-year-old who stood resolute, taking the muck and the bullets while the rest of his team-mates kept hitting Arsenal on the counter. De Gea, Valencia and Matic are key to United's title hopes. If they can remain fit for the rest of the season it will release the likes of Pogba and others to get in behind enemy lines and do untold damage. That is, of course, if Pogba can stay on the field. I always knew Philippe Coutinho was a genius, and his free-kick against Brighton proved it. While everyone - including me - was waiting for one of his trademark efforts to fly into the top corner of the net, the Brazilian magician shaped up in his usual manner, but this time, and to everyone's amazement, he deliberately struck his free-kick under the feet of a jumping wall. The look on the faces of the Brighton players appeared to be a combination of disbelief and admiration. On reflection, I don't know why we were all so surprised. Coutinho is as creative as he is instinctive, and clearly spent some time thinking through ways in which he could make life just as difficult for those walls who had worked out how to defend his free-kicks. Brighton not only failed to defend Coutinho's free-kick, but demonstrated exactly what happens when a wall moves. The moral of the story is that walls are not intended to move - period. If they do, and it goes through or under the wall, then it is the fault of those in the wall. You certainly can't blame your keeper. I found it hilarious that, during Saturday's post-match news conference at Stamford Bridge, some journalists wanted tips from Blues boss Antonio Conte on how England can stop Eden Hazard in next year's World Cup finals in Russia. The draw has thrown up a mouth-watering fixture against Belgium, and Hazard is in fantastic form. Conte refused to be drawn, of course, but did offer a crumb of comfort by suggesting England's Gary Cahill knows his club-mate as well as anyone and it should be a good contest and an excellent game. Well, when Chelsea played Newcastle it was like men against boys, and Hazard ripped the Magpies apart. I was not in the least bit surprised that Magpies boss Rafa Benitez had a face like thunder after the game and his responses were so clipped. The writing is on the wall if additions to the squad are not found in January. These Newcastle hopefuls need more support and Benitez knows it. I was almost laughed out of BBC's Final Score studio when I insisted that, given the right resources, Benitez could turn Newcastle into title contenders. Why the comment was greeted with such bewilderment, I have no idea. Anyone who knows anything about football should know that Benitez has done it before at Valencia. If he can stop football giants like Barcelona and Real Madrid from winning the title, he can certainly do it against both Manchester clubs. I expected Brighton to lose against Liverpool, but not so comprehensively. I'm not sure this will be any consolation for the Seagulls, but they will not be facing Coutinho, Mohamed Salah or Roberto Firmino every week. It was a terrific performance by the Merseysiders, and Firmino took complete advantage of the exhilarating performances of Coutinho and Salah - both of whom looked unplayable at times. However, losing 5-1 is no fun, especially when Reds manager Jurgen Klopp is fist-pumping every goal and celebrating with his staff like it's the final of the Champions League. I understand the importance of winning, but this was Brighton. What I do take exception to is any manager being kept waiting to shake hands once a game has finished, while his opposite number finishes hugging and kissing his players and staff in celebration of their victory. I sense this was exactly what happened after the final whistle, and why Chris Hughton tore a strip off Klopp immediately after the game and quite rightly. What is happening to the traditions of this great game? Has winning and money destroyed everything we hold dear? The convention is we shake hands immediately after a game because it brings closure to the occasion, and it starts with the managers. The game's conventions are bigger than any manager or player, and if either can't be bothered to perform the duty, I suggest they find another profession that can afford their bad manners. I've been saying for weeks: Mourinho should take the shackles off these boys and let them go and play. He should have done it against Liverpool at Anfield. If he has any chance of catching Manchester City, he must take risks and start winning on a regular basis away from home. The timing of Jesse Lingard's introduction to the fray by Mourinho has been nothing short of brilliant. Credit where credit is due. I accused the United manager of being cowardly and gutless at Liverpool, but that couldn't have been further from the truth at Watford in midweek and against Arsenal at the Emirates. Not only did United look devastating on the break, but the speed of the transition largely carried out by Lingard was extraordinary. The way the youngster was linking the midfield play and transforming it into attack was quite phenomenal. It was Lingard who started the move for United's third goal before linking with Pogba (who made Koscielny look foolish by the way) for the Frenchman to return the pass to his team-mate to tap in the return. I said after Arsenal defender Shkodran Mustafi's display against Spurs that he can be brilliant as he can be disastrous - his performance against United was pretty disastrous.